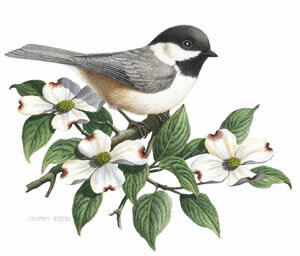 Actually, there is a lot of nature in almost all of Dempsey’s paintings but a few, like the gull on the beach and the bluebird on thepost and the absolutely beautiful mountain stream “Wilson’s Creek” just call out to be classified as a ‘Nature prints’. You’ll enjoy these scenes that smell of salt air and wildflowers and the sounds of flowing water and birds. A joy of September is the arrival of the morning glory in gardens and cornfields just in time for harvest. The morning glory with its twining vines and bell shaped flowers that last only for a day, adds a wonderful touch of color to the landscape as the fall season nears. 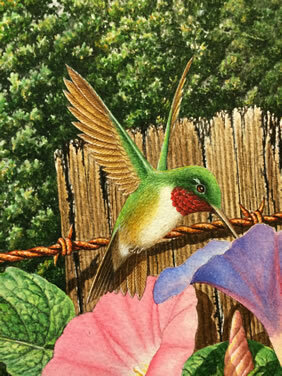 The rendering is a happy depiction of hummingbirds, a bluebird and a butterfly enjoying the freshness of an early September morning. May this painting alert you to the abundance of morning glories on our surrounding countryside. Distinguish the male hummer and then look closely for the hidden hummer. "Since our last posting, our fine art printer and long time friend, Tom Hall passed away after a sudden two month illness and we are still reeling from that loss. Due to that and my upcoming retirement, I am sad to report that there will be no fall print release. As I prepare for our last Christmas season in the shop, I have released a small edition print that features my favorite subject matter. It will be sold framed only, on a first come basis." Rumor has it that thousands of hummingbirds failed to make migration but rather chose to meet on local power lines with area bluebirds to discuss the retirement of Hummingbird Artist and Bluebird Lover Dempsey Essick. 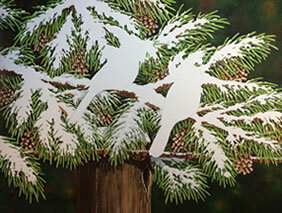 "Hangin' Out in the Pines"
Yes, hummingbirds are migrating south now but cardinals, on the other hand, are flocking to the Dempsey Essick Gallery in Downtown Welcome for the release of his new print, “Hangin’ Out in the Pines”. This hidden hummer included here is very subtle but easy to see because of its size. Also, how many pine cones do you count in the painting? “Our days are long when Dempsey is working in the studio,” shares wife, Shelley Essick. 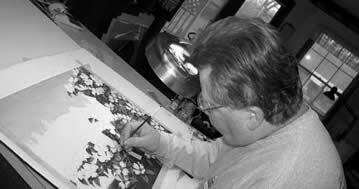 “When Dempsey is focused on a painting, he works from morning into the night; sometimes 18 hours at a time. He may go several days and not speak a word. I have learned that this is a good thing and to leave him alone. When he is truly focused his mind is not wandering and he gets more accomplished." "We don’t go out to eat during these time and we don’t have a social life. Background noise is usually westerns. I go to the library and check out all the old cowboy movies. He knows them all by heart because he plays them over and over and over again." "Painting is his priority and he sticks with it. The end result of all this effort are these beautiful, breath taking works of art where the grass is painted literally blade by blade or each leaf is made up of three shades of green." 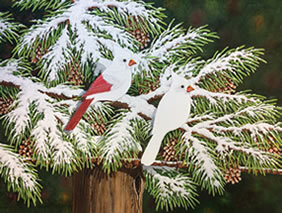 Hangin' Out in the Holly is a sister piece to "Hangin' out in the Pines" together make the perfect composition. Dempsey Essick is not just a bird lover; he is a bird fanatic. 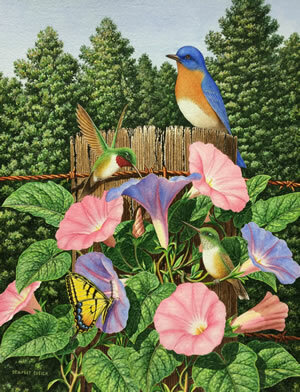 In addition to his beautiful depictions of birds in many of his paintings he is a past president of the N.C. Bluebird Society and speaks publicly about the plight of the Eastern Bluebird. He started a bird watching club in his own community and has come to be known as the Hummingbird Artist Outside his studio window he keeps a table full of tasty treats (everything from crushed egg shells to softened raisins to cornbread) for the birds so that, when he is working on a painting he can be constantly entertained by every type of songbird native to the Piedmont Region of North Carolina. Just recently, he was visited by an itinerant peacock who had undoubtedly heard about the free smorgasbord at the feeding station in the Essick back yard. The peacock hung around for a few days then departed for parts unknown. 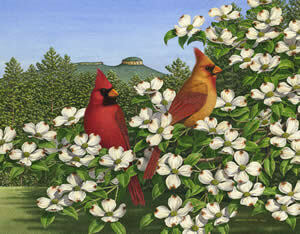 For "Carolina Calling," Dempsey has portrayed a pair of cardinals on the limb of a dogwood which is in full bloom. 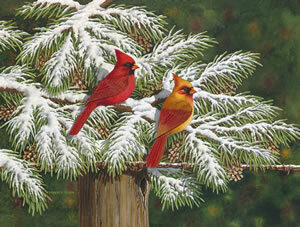 It is the nesting season and the cardinals, who mate for life, are looking for the ideal spot to raise their family. 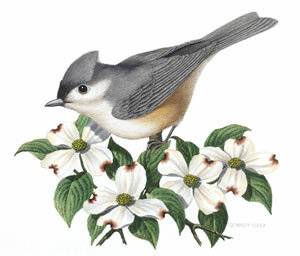 The cardinals and the dogwood are official symbols of North Carolina. Pilot Mountain, in the background, is not an "official" symbol but it is one of the best known landmarks in the state. Centuries ago, the Sauratown Mountains in Surry County stood tall and imposing but, over the years the mountains have eroded away leaving the spectacular knob of quartzite that we now call "Pilot Mountain." The mountain served as a guidepost for the earliest natives and for the later settlers as they migrated south to settle Piedmont North Carolina. Pilot Mountain is the perfect background for Dempsey's painting; it establishes the locale, adds interest to the overall picture and brings a touch of natural beauty into the life of every viewer. Cardinals have been good company to me. They stay year round and visit my feeding station daily. I take breaks from my painting to fill all the feeders with a variety of food. 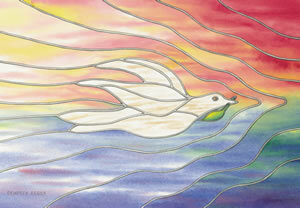 I am faithful to the birds and they are faithful to me. As for the dogwoods, they are my favorite flowers. One joy of spring is watching the dogwood tree outside my studio window. Cardinals are abundant and their colors are striking against the contrast of the blooms. 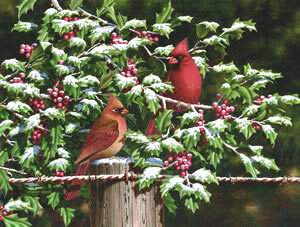 I have always wanted to paint a pair of cardinals especially after I held and studied a juvenile cardinal that became trapped in our carport. We made several photos and the experienced only increased my love of birding. I searched for a place to do my cardinal and dogwood painting but around home was not a good location. I sought out a dogwood tree in Surry County just south of Pilot Mountain for this view. I made my photographs just off of Caudel Road on an old tractor path, about 5 miles from the mountain. 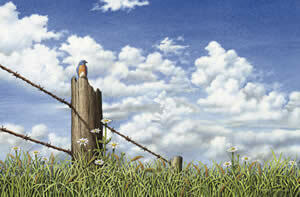 This is a simple yet very detailed painting that speaks of spring in North Carolina. 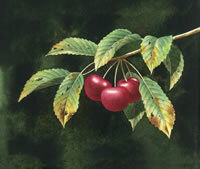 Red, in watercolor, requires multiple layers to create the proper effect of the subject matter. It is probably the most difficult color to work with and I had to take extra effort in painting the birds so their softness and feathery look was maintained. I stood for most of this project (it made my back feel better) propped over my drawing board for long hours painting multiple layers in each petal of the dogwood. Each petal has no less than 3 layers of paint of it. Since every dogwood bloom is unique, the challenge for me was to make sure that each bloom I painted was different in shape and size. A birding surprise during this painting event occurred in late March when I looked out the window at the feeding station and there stood a beautiful peacock, eating with all the other birds. I gasped, ran for my camera, and got a quick shot before it disappeared. Now I have added yet another bird to the list of those who have dined at my table. "Cherry Pickin' Good I & II"
Dempsey and Shelley Essick have this old, black cherry pitter that has been in the family so long it is like a fixture or an old friend. Every summer they get it out and clean it up for the annual cherry harvest. This summer will be no exception. When the cherries turn red it is like a signal flag to every bird in the neighborhood that it is "Cherry Pickin'" time. The humans have to race with the birds to get at least a fair share of the enticing fruit. Anything easy to hold is a suitable container for picking. 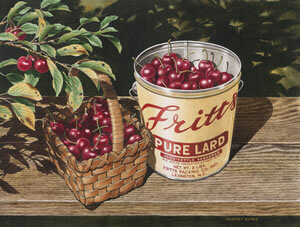 In his painting, "Cherry Pickin' Good," Dempsey has filled a small, hand woven, basket and an old "Fritts Packing Company" lard can. They'll empty these into a large bucket then fill them up again. The whole time the birds will be circling, squawking and waiting their chance at the tasty red berries. In his painting, Dempsey has captured the essence of summer at that point where mother earth is beginning to yield her bounty. A few of the leaves are beginning to change color and, soon, a light sweater might feel good in the evenings. There can be no better way to end one of those cool days than to sit down to a slice of cherry pie, still warm from the oven, with a bit of rich cream to pour over it. No artist working today is any more skilled at reproducing, exactly, small segments of our every day lives in such a way that each of us can see the larger picture in our minds. Never mind that each viewer may see a slightly different picture, depending on his or her past experience, the picture is still true. Great art is not just a delight for the eye but touches the heart, the soul, and the mind. Erupting through the sand of North Carolina's outer banks like giant smokestacks, a chain of picturesque lighthouses guide passing ships around the notorious "Graveyard of the Atlantic." Each of the lights can be identified, at night, by its distinctive flashing signal. Four of the lights, built on the Cape Lookout plan, look enough alike in daylight that each light has a distinctive "daymark." Cape Lookout is painted in black and white diamonds; Cape Hatteras has a black and white spiral; Bodie Island has black and white bands; and one light, the one at Currituck Beach, near the village of Corolla, was left unpainted. 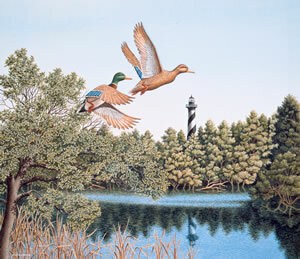 The oil wicks were first lighted in the Currituck Beach Light on December 1, 1875. Burning whale oil at first and later kerosene, the keepers carried the oil up 214 spiral steps to fuel the light. The rotating mechanism, which was powered by weights, much like a grandfather clock, had to be rewound every two and a half hours throughout the long and frequently stormy, night. The first order Fresnel lens, which was installed when the tower was built, is still in use today, sending a warning flash of light every twenty seconds across nineteen nautical miles of treacherous ocean. 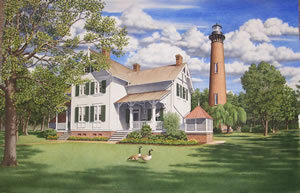 In his painting of the Currituck Beach Light Station, Dempsey Essick had focused on the three-story, Double Keepers Quarters. Prefabricated and hauled to the site, the house is the lone survivor of three US Lighthouse Service, Grand Duplex style houses using the "Stick Style" architecture that has since been copied by hundreds of beach dwellings and is now known as "Outer Banks Style." Dempsey's meticulous attention to detail includes the interconnected roof gutters designed to route rainwater to the covered and ventilated underground cisterns at each side of the house. The cisterns were the only source of fresh water for the two families who shared the three-story dwelling. Viewers who are unaccustomed to the rich detail of a Dempsey Essick painting will be delighted as they delve into the picture and become aware of the small touches like the tree leaves and flower petals, and the bricks, and the wood grain. 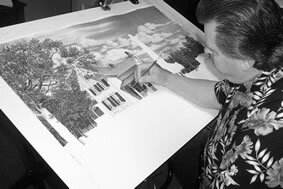 Those who have done some painting themselves will be astonished at the technique, especially the realistic cloud formations, thought by many to be impossible using watercolor. Dempsey has experimented for years to perfect his own technique to realistically reproduce cloud formations in his paintings. The beautiful bank of cumulus clouds behind Currituck's brick tower is a testament to his persistence and his devotion to his craft. In the end, the viewer comes away with a sense of what it was like in the early days, before there was even a road to Currituck. In those days the Keepers and their families came by boat, by horse and wagon, and, later, in cars with half the air let out of the tires for traction in the sand. They were the people who worked in the face of hurricanes to keep the sea-lanes safe. 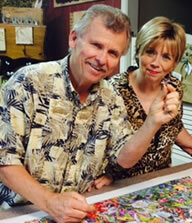 They cultivated gardens and planted flowers and made a home in the wilderness. And always - always towering in the background, there was The Lighthouse, dominating and insistent like a beautiful but dependent child, always in the comer of the eye, always demanding the full measure of the Keepers time and energy. In "The Currituck Keepers Quarters," Dempsey Essick has captured more than just a beautiful and historic scene. He has also captured a glimpse of the spirit of independence and self-reliance that has made our country great. Living on the Piedmont plateau of North Carolina, Dempsey Essick has always felt fortunate to be in such close proximity to the white sand beaches and the islands of the Outer Banks with their great fishing and picturesque lighthouses. At the same time, it is only a short drive west to be in some of the most beautiful mountains in the world, the beautiful Blue Ridge Mountains of the Appalachian Range. Some of Dempsey's fondest memories are of family picnics along the Blue Ridge Parkway and splashing in the tumbling waters of a cool stream. The play of sunlight on the still pools and reflections from the smooth rocks and verdant foliage, even when he was very young, appealed to his budding artistic sense. In those early days, he was awed by the absolute silence of the deep forest, the lush green of trees that were there when Columbus discovered America. He is still awed by those same things today. He spends much of his leisure time hiking, fishing and camping in the mountains. One of Dempsey's favorite spots for camping is the Mortimer Recreation Area, in the Pisgah National Forest, just south of the Edgemont community. He spent two days on the hiking trails, looking for a scene that would speak to him and tell him that here was the site for his next painting. He had left the dirt road and was wading upstream in Wilson Creek where there was no trail when he came around a bend in the stream and the bells and whistles went off in his head. There before him was a view that almost took his breath away. In the foreground, right at his feet, was a small rapid with the crystal clear water tumbling over rocks smoothed by centuries of being immersed. Just beyond was a clear pool that seemed to invite a dry fly. Framed by the break in the trees was a splendid view of the summit of Yellow Buck Mountain and, off to the right, leaning into the picture as if to say "look at me!" was a lone evergreen pine tree. Dempsey knew instantly that this was the scene he had been looking for. 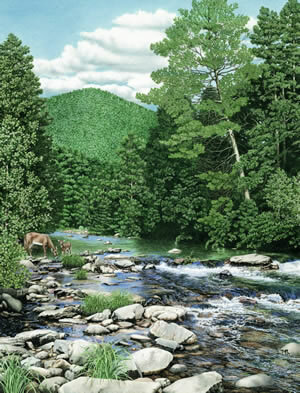 Back home, with the pictures spread out to bring back the image that he carried in his mind, Dempsey started the long and labor intensive process of depicting each rock, each tree, each reflection that would take the viewer into the mountains with him to experience "Wilson Creek." A part of every painting is fantasy and Dempsey pictured in his mind what the scene would be like without the intrusion of a human. With that thought in mind, he added the doe and her fawn because that would truly be natural to the scene he was painting. Those familiar with Dempsey's work will recognize a maturity in his more recent paintings. As he ages as a man, it is natural that his work matures also. Now, at this stage of his life, Dempsey Essick is producing the best work of his life. In his painting, "Vineyard Rendezvous," Dempsey Essick has filled the frame with ripening muscadine grapes hanging from the parent branch. Contrasted against the distinctive muscadine leaves, a pair of goldfinches sporting their new summer plumage of bright yellow and black seem to be scouting for a nice location to build a nest. The male goldfinch, typically, sports the brighter colors so that he may fulfill his function of guardian. Being more visible, the male can cry and fly across the path of intruders and distract them from the nesting female who has retained much of her duller olive coloration so that she is harder to see when she is sitting on the nest. They couldn't have found a friendlier neighborhood than the Essick backyard. 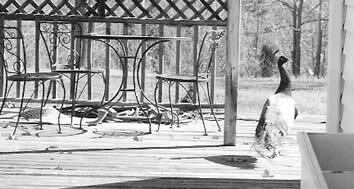 Dempsey, the bird lover and past President of the NC Bluebird Society, loves not only bluebirds, he loves all birds. His back yard is an avian oasis where he feeds mealworms to the bluebirds, sunflower seed to the cardinals and wrens, Algerian thistle seed to the goldfinches, peanuts to the woodpeckers, and bread crumbs and crackers to the ground feeders. Yellow is the color of springtime. After the snow and ice and the drab leafless trees of winter the first yellow blooms of the forsythia give us the promise of springtime. Daffodils pop out of the ground and there are yellow flowers in almost every yard. But it is when we notice that the goldfinches have changed from winter drab to bright yellow and black that we know it is time to get out the short sleeves and sharpen the blades on the lawn mower. And if you don't happen to have one of the tube thistle seed feeders that draw goldfinches like a magnet you can still enjoy Dempsey's painting which is like having a bit of springtime right in your room all year round. Those who admire Essick's work will not be disappointed with "Vineyard Rendezvous." On close inspection the viewer will see that his powers of observation and natural sense of proportion seem to improve with time. Indeed, while his work ethic drives him to work long hours on each painting, it is his eye for beauty and composition and his love for his subjects that come through in each of his pictures. 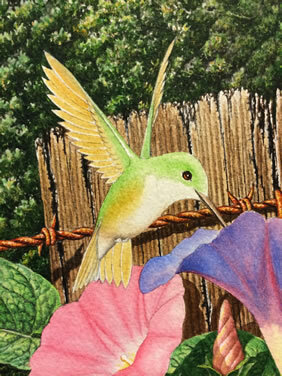 As is the artist's custom, he has included a hidden hummingbird image in the painting. 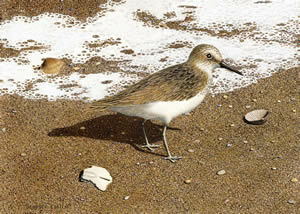 In “The Fledgling”, Bird lover, Dempsey Essick, has captured one of life’s defining moments. Against the backdrop of Pilot Mountain. Mother and father Eastern Bluebirds patiently coax the last of a brood of four to take a leap of faith and fly to a nearby tree where her newly fledged sister and tow brothers are waiting. The youngster is being asked to leave the only world she has ever known, the nest inside the protective box where she hatched and where she has been protected and fed. The experienced parents understand what the child is facing and are patient, knowing that there can be only one conclusion. 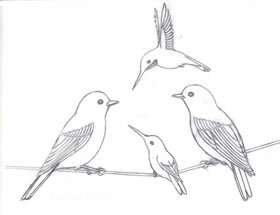 When “The Fledgling” finally leaps into space she will discover a freedom known only to a bird. She will exult in zooming to the highest branches, soaring over the landscape, even to the very outside a nesting box, coaxing her own fledglings into that first step into thin air. The setting for “The Fledgling” is located in Surry County, North Carolina, in the small community of Perch. The view is the south side of Pilot Mountain from the Jack Fulk Farm. The farm is located at the intersection of Grassy Creed Road and Perch Road. “When I was small and I saw that view of the mountain, I knew that I was close to home. 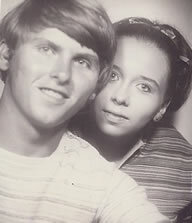 It now reminds me of the family members that have gone on and it comforts me with memories we shared,” said Ann Blackburn, daughter of the late Mr. Fulk. Ann’s comments were one reason that Dempsey was drawn to this site. While “The Fledgling” is a straightforward landscape painting is was, technically speaking, one of the most labor intensive painting Dempsey has done. 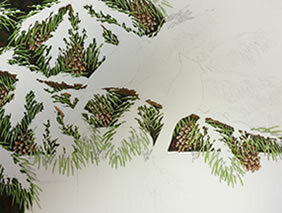 To attain the “Essick Look” each leaf and blade of grass had to be delineated, shaded and highlighted. There are no shortcuts in this style of painting. 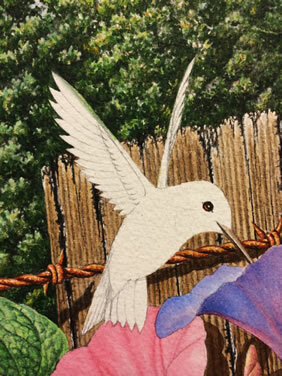 Only hundreds of hours of intense effort can bring about a painting like “The Fledgling”. The reward, in the end, is when the artist steps back after the final brush stroke and, through strained and burning eyes looks at what he has accomplished and knows that it is good, that what he has done is worthy of his reputation. The bluebird box in “The Fledgling” is one designed by Dempsey and, unlike most bluebird boxes, features a rounded top to divert rainwater from the entrance hole. 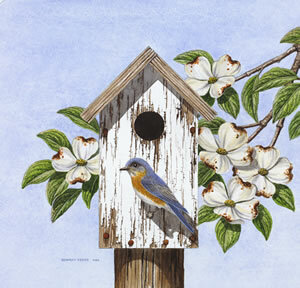 Dempsey feeds birds at home and has also put up a bluebird box behind the Gallery in Welcome. 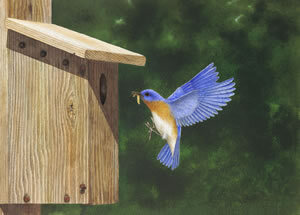 He was delighted when a pair of bluebirds took up residence less than ten minutes after he had finished with the box. 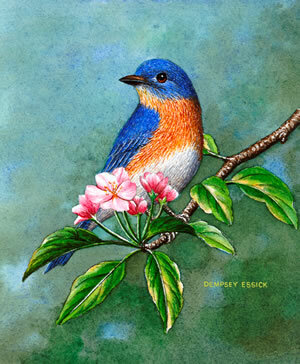 In 2002, the North Carolina Bluebird Society elected Dempsey as president because of his enthusiasm and love of the bluebirds. His desire is to educate the public on the conservational needs of this challenged species. 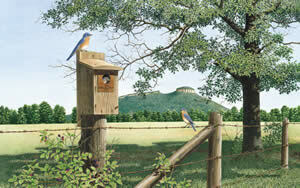 Visitors to the Essick Gallery in Welcome can pick up brochures on the Eastern Bluebird as well as plans for building a nesting box.